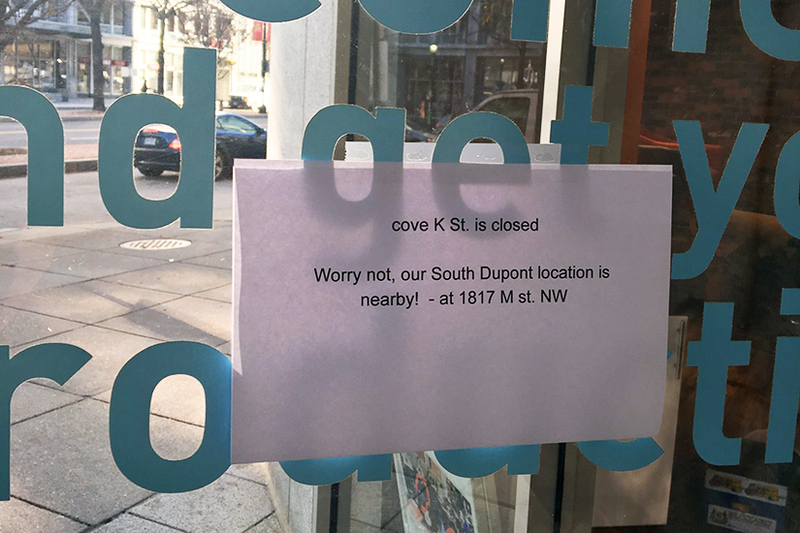 Yes, unfortunately I can confirm the sad news that cove K St has been closed. This summer, we made a series of improvements to coves across the city — upgraded workstations, more call boxes, and separate focused and social sections for different kinds of work styles — and ultimately decided that we didn’t think we could bring our K St location up to our standard for the best member experience possible. The good news is that cove members in the area are well-supported by our South Dupont location that sits just 3 blocks away, as well as our other locations in the 14th St, Chinatown, Columbia Heights and Eastern Market neighborhoods. We’ve learned a tremendous amount from operating our first downtown location and its closing will enable us to focus on future growth and locations that deliver the full member experience. We are excited to extend cove’s offering to new neighborhoods and communities in 2017. Co-working startup Cove appears to be scaling back its operations in D.C. The co-working space also no longer appears on the company’s list of locations. Workers were spotted moving things out of the space earlier today, a reader told Borderstan. Cove’s locations on 14th Street and in Dupont, Columbia Heights, Chinatown and Capitol Hill are still listed as open on the company’s website. We were unable to reach a Cove representative for more infromation. We’ll update this story if we do.